Let’s Talk about the Tauntaun in the Room. I haven’t seen Star Wars Episode VII: The Force Awakens. I have no idea when I’m going to see it. I may not even see it in the theater. 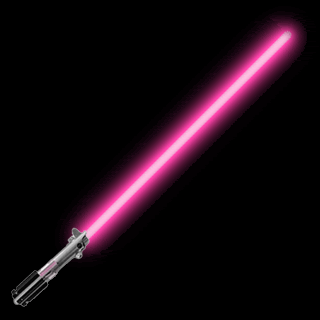 I am the father of a pink Jedi. In honor of Star Wars Day, I present to another conversation that had with my eldest daughter. Her: Can I have a Star Wars game next time you go to the store? Me: I don’t even know if you like Star Wars. You are still to young to see it. Her: If it was pink, I would like Star Wars. I’m not sure if I should be proud or ashamed. Actually, that’s a pretty good summary of my life so far. May the 4th be with you everyone! This week, I’ve been away from my keyboard more than I’d usually like. My work has stepped up the remodeling plan (demolition is coming next week or the week after) so we’ve all been coming in early or staying late in order to get things moved (roughly 80,000 used books, 90% of our music department, 90% of our gifts department, and our shipping/receiving department) before the bulldozers knock off the front half of our building. Anyway, as a result, I took one night and set up the blogs for this past week to post automatically. Axe Cop – This is web-comic about a cop with an axe. The thing that makes this site great is the fact that all the stories are written by a 5 year old (although that was when the comic started, now he’s 7) and then drawn by his 30-something year old brother. Why is this great? Because many of us have forgotten how a child thinks, and if you want to relate, either as a parent or a writer or both, it’s a wonderful way to climb into the mind of a child for a few minutes. The Hero’s Journey: If you have ever wondered why some stories seem to get written over and over, there’s a reason. Think of Star Wars, The Lord of the Rings, and even the story of Moses from the Bible. 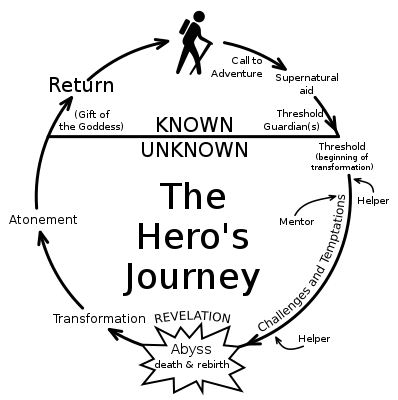 Joseph Campbell came up with something that he called Monomyth or The Hero’s Journey. If you are writing a tale of epic proportions and need an idea of where you are going, or if you are a reader and you’d like to be a better critical thinker while working through that book on your nightstand, check it out. Also, I’m not the only one to write about this theme, here’s a bonus link to another blog on the same topic. 10 Flash Fiction Writing Tips: This week, I’ve been a bit focused on flash fiction. If you want to try your hand at writing ridiculously short stories, here are some things to keep in mind. I should probably start using this advice myself. So, there you go. Just when you thought you were tired of the internet, I give you all these reasons to go back online. 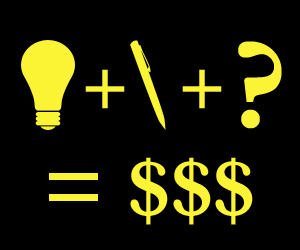 Oh, one last plug for my contest and we’ll be all set. Check out yesterday’s post for full details, but it’d be great to get some entries. 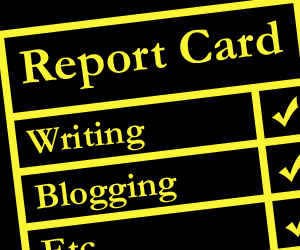 As far as a report card for this week, I made sure that something posted on the blog every day, so that’s good, but I didn’t spend everyday writing for it, so less good. I went out writing twice and last night I added about 700 words to my manuscript. I’ll give myself a solid B. Okay, that’s it, now have a nice weekend. The world doesn’t need another blog. But here it is anyway. My name is Josh Mosey. I’m a happily married man who works full-time in a bookstore. My wife is an accountant who works for a company that sells color. I’m bad at math and colorblind. Together, we make sense. We also make babies. Our oldest is a year and half old as of this post. Our newest has a couple more months of blissful ignorance before being thrust into this messy thing we call the world. Why do a blog? In addition to being a husband, a father, a bookstore employee, bad at math, and colorblind, I am also a writer. I write speculative fiction and humorous flash fiction. Speculative fiction is the umbrella term that hold things like sci-fi, fantasy, and dystopian literature. Think Star Wars, Lord of the Rings, and Hunger Games. Flash fiction is really short stories. I mean really short. Usually 500 words or less. Most of my flash fiction revolves around a pair of roommates, Thom and Tom. These stories are perfect for readers (and writers) with short attention spans. As of yet, I’m not published and I don’t have an agent. But I do have stories. I have ideas. And now I have a blog.